8th February 2019, peacefully at Prospect Private Nursing Home, formerly of Dunvale, Ballymena. Beloved wife of the late Joe, R.I.P. loving mother of Leonard, Joe and Tony, dear mother in law of Wilma and Jennifer and devoted grandmother of Laura, Stuart and wife Annemarie, Vicki, Rhegan and Kenleigh. Her remains will be removed from Henry’s Funeral parlour, 100 Broughshane Street Ballymena BT43 6EE on Tuesday 12th inst. at 9.40am to All Saints Church for funeral after 10am Requiem Mass, interment afterwards Ballymena cemetery (Cushendall Rd). Friends welcome at the home of her son and daughter in law Joe and Wilma, 81 Gracefield, Gracehill from 12noon on Monday 11th February. 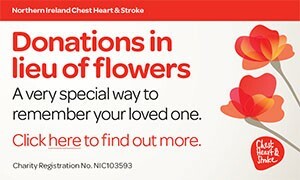 Family flowers only please, donations in lieu if desired may be sent to James Henry (address above) for The Dogs Trust. Lovingly remembered by her family and family circle. I am sorry to tell you that Marie McCALL has passed away.